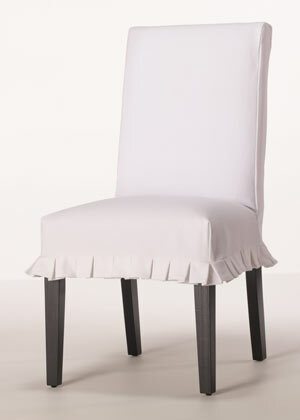 How about slipcovers for your dining chairs? 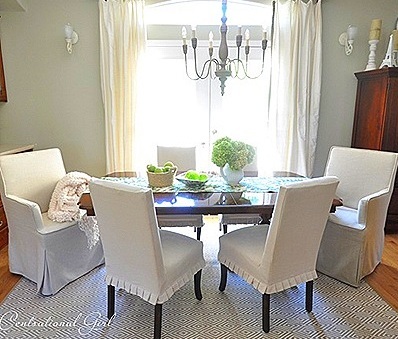 I love the look of these short skirted slipcover. It is so chic. I am going to give this a try…I think…I will let you know! I had a customer bring me a Martha Washington Bedspread and asked if I could make dining room chair slipcovers – which I did – and they looked fabulous! I wish I had a picture to post. This was a great idea and the look and feel was fantastic. It gives a crisp, clean and casual look, but not shabby chic casual….your fabric selections make a big difference in the end result. Ask the client to take a picture. I would love to see your work!